this past week as i was stocking up (again) on cereal from the grocery store and then proceeded to put away said cereal in my pantry, i noticed that 99% of this cereal *i* would never eat. not that i haven’t eaten it in the past – i used to love this stuff. lucky charms – amazing. reese puffs – used to be my fav. but maybe my tastes have changed or maybe i’m more conscious of the things i eat now because i really have zero desire to eat cereal like this in the morning. 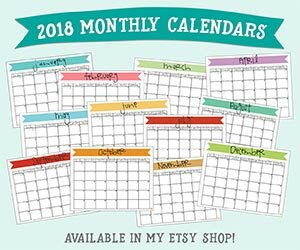 i’ll leave that up to my husband and kids (and believe me, they are totally up to the task!). 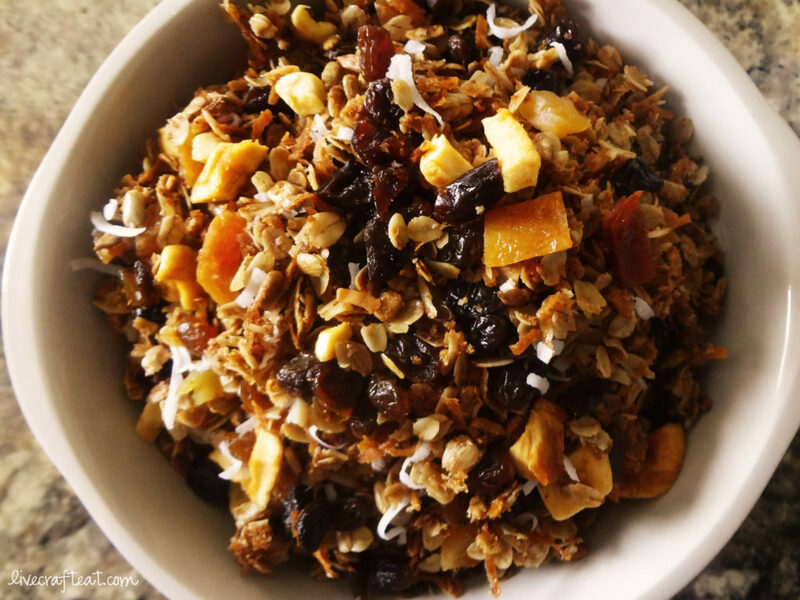 so i called up my mom and asked her for her granola recipe i remember she used to make – now that i’ve grown up and have changed my ways for the better, i’m excited to have a ready-to-eat breakfast that gives me a good start to the day. 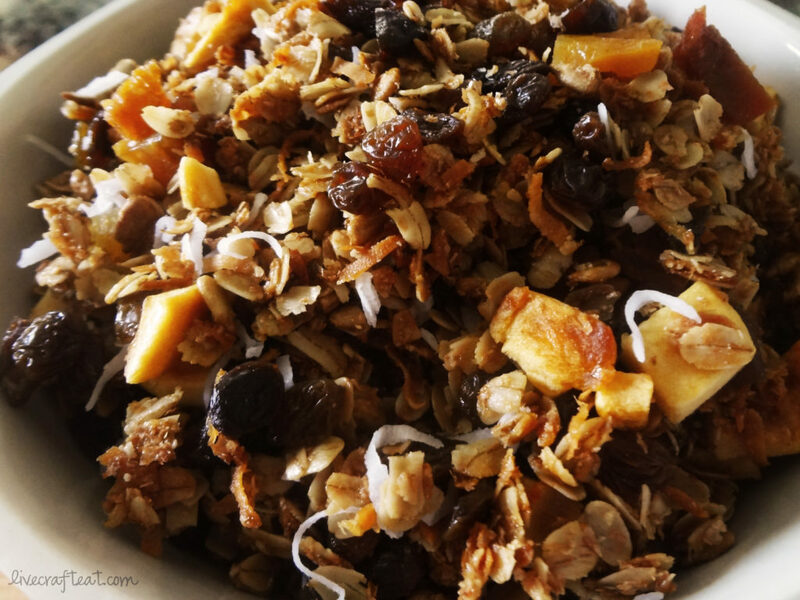 …and then you’ll need some shredded coconut and your favorite dried-fruit add ins (chopped if large): golden raisins, dried cranberries, apricots, apples, pears, figs, etc. use what you like, and in whatever amount you like. 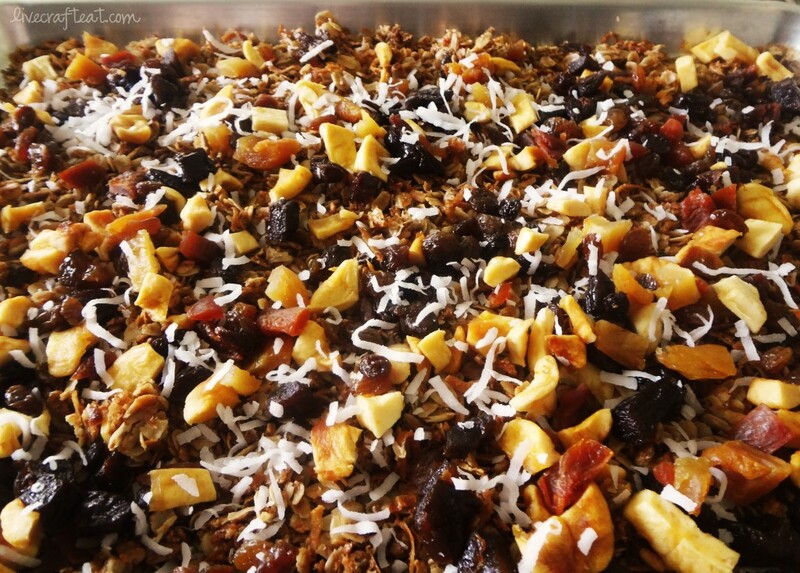 for me, the more dried fruit the merrier. 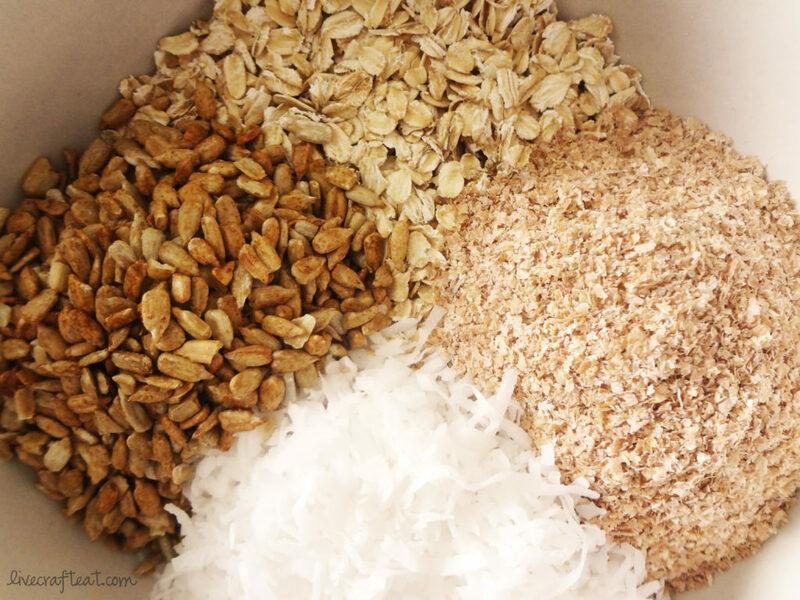 the first thing you need to do is mix together the oats, wheat germ, coconut, and sunflower seeds in a large bowl. 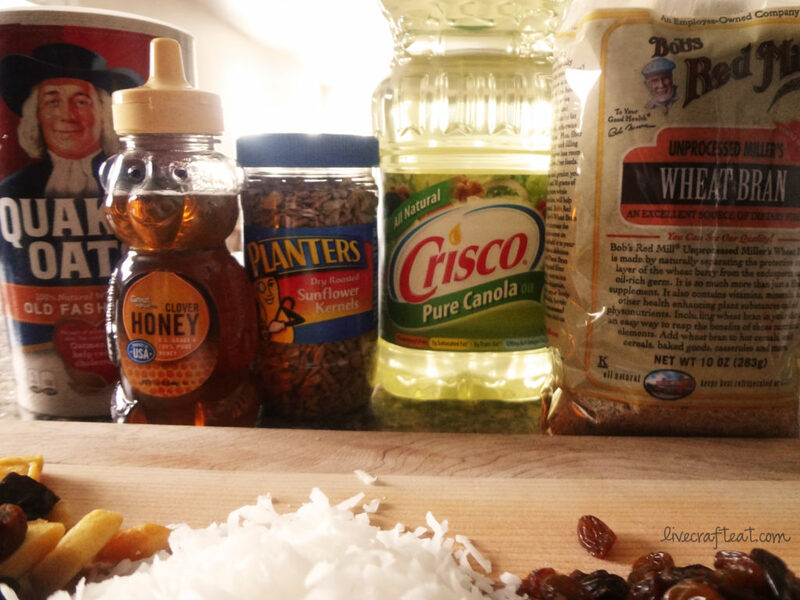 then in a microwave-safe bowl, whisk together the honey, canola oil, salt, and milk. heat it in the microwave for about 30 seconds or so until the honey softens a little and it’s easy to stir together. 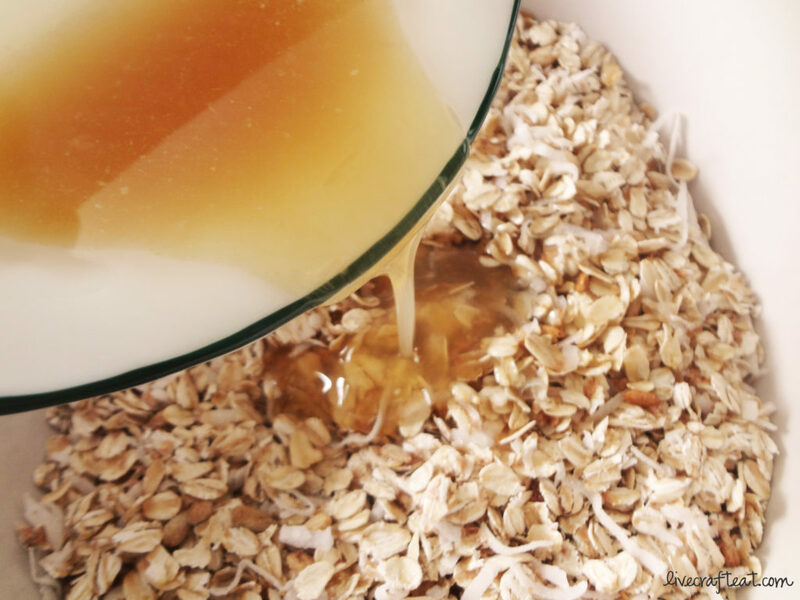 pour it over the oats mixture and mix. spread everything out on an un-greased cookie sheet and bake for 1 hour at 275. make sure you stir it every now and again to make sure nothing is sticking and everything gets evenly toasted. please note: i only did 1/2 a batch, since i’ll most likely be the only in my family eating this. the rest of them have their cheerios, ya know…. 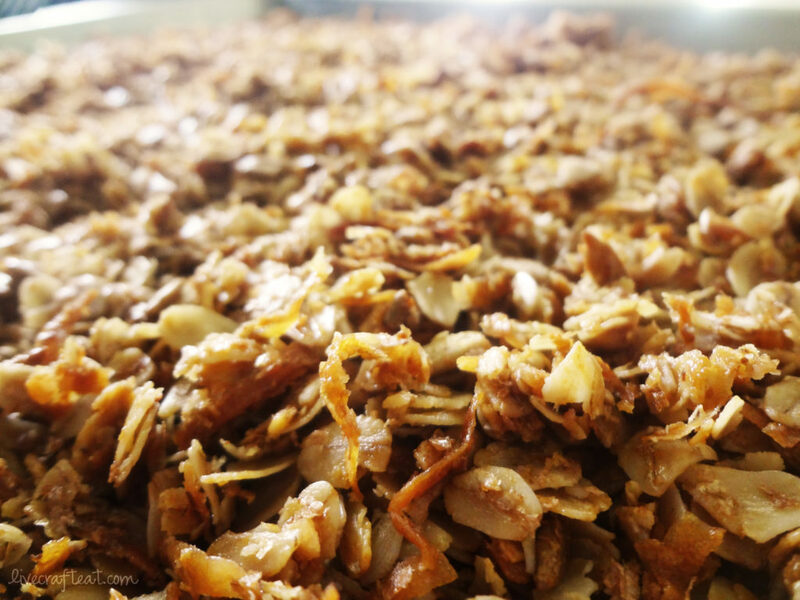 if you are going to make a full batch, you might need 2 cookie sheets to bake it all. and when it’s done – you’ll know. it’ll be browned and toasted and your kitchen will smell amazing! 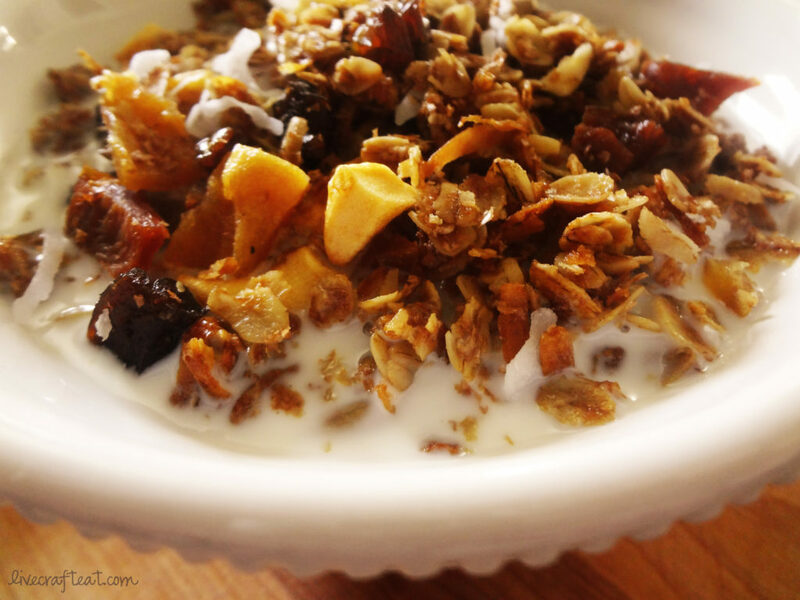 once it’s cooled down, add in your dried fruit. and if you’re like me and happen to adore coconut, put some more of that in, too. hello, darling. doesn’t that look delicious?!? i’m so excited to eat this right now. store in an airtight container for approx 1 week. 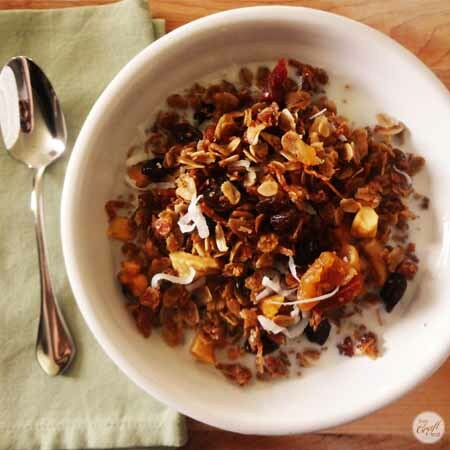 when you’re ready to eat it, pour it in a bowl and simply add milk. glorious. 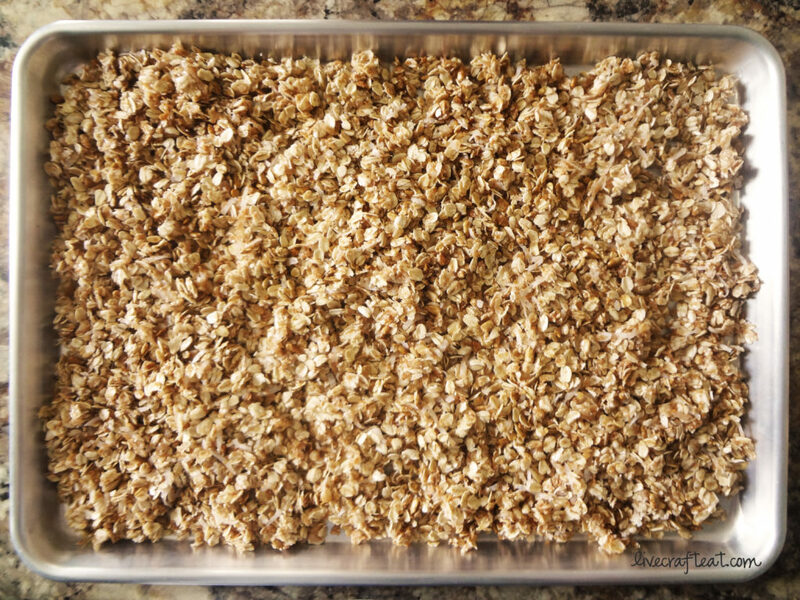 in a large bowl, combine the oats, wheat germ, coconut, and sunflower kernels. mix well. in a microwaveable bowl, whisk together the honey, oil, salt, and milk. microwave for approx 30 seconds until honey is soft enough to stir. pour over oats mixture and stir to combine. pour mixture onto un-greased cookie sheet in an even layer (you might need 2 cookie sheets). bake for 1 hour at 275. stir occasionally. when mixture is done baking, remove from oven and cool. 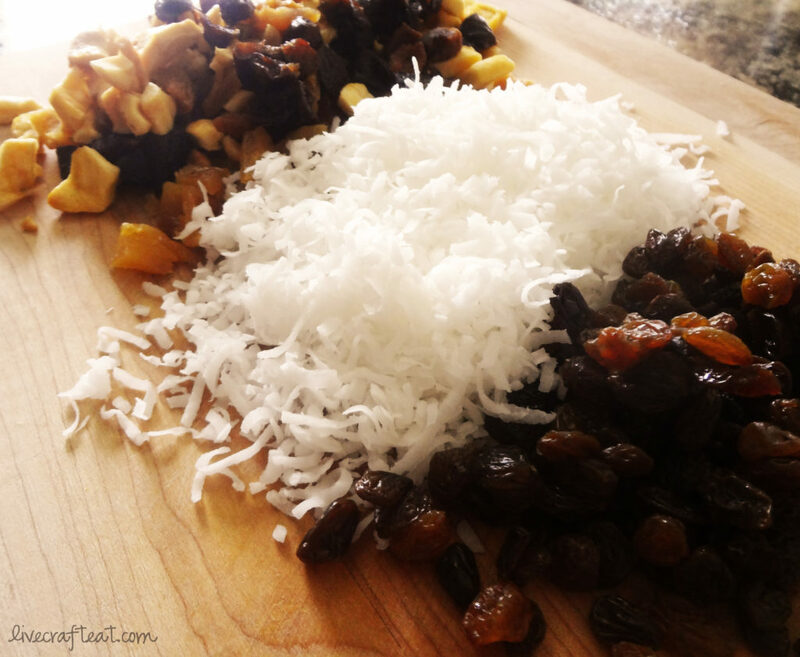 add in dried fruit and stir to combine. store in an air-tight container for approx 1 week. enjoy! I LOVE this recipe. Brings back thoughts of home. Thank you so much for reviving this recipe. I’ve been trying to find it forever! I’m so excited to make it again. And yes, I’m ready for some healthier breakfast choices too! yay!! i’m wondering why it’s taken me this long to make it again!? it’s soooo good! Thank you so much for posting this recipe! 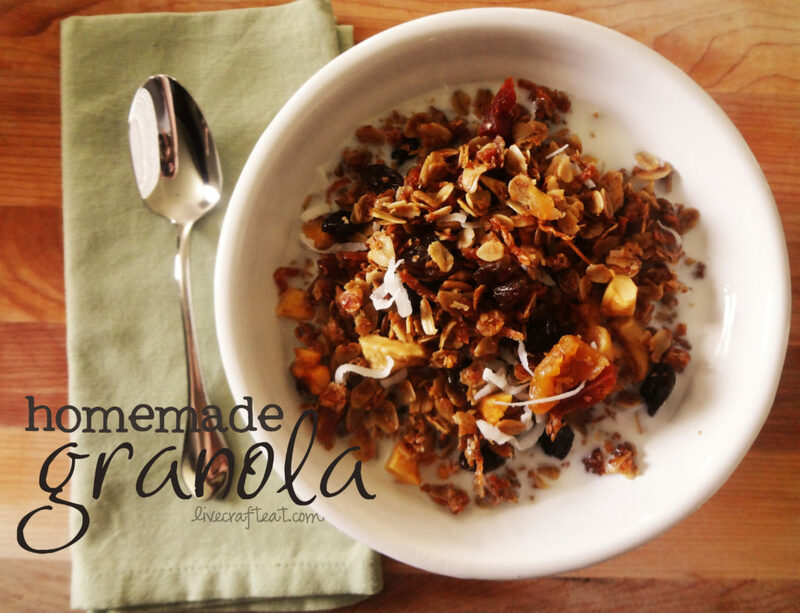 I have honestly been looking for a good granola recipe all last week and I didn’t like any of them. This one looks delicious! I can’t wait to make it. You always have the best recipes.